In the wake of Snowden’s now ageing revelations about governmental snooping a wave of ‘ultra-secure’ personal servers hit the market, promising to give you access to all your documents, files and anything else you need – just like using the cloud – but without all the data being stored elsewhere. Obviously, if you’re technically inclined and want to set up your own personal server, then there are cheaper ways to do it than considering an out of the box answer. If you don’t have time for the faff, but want a realistic option for keeping your data safe, yet accessible, then something like the Shirleybox, Wedg or the Protonet could be exactly what you’re looking for. 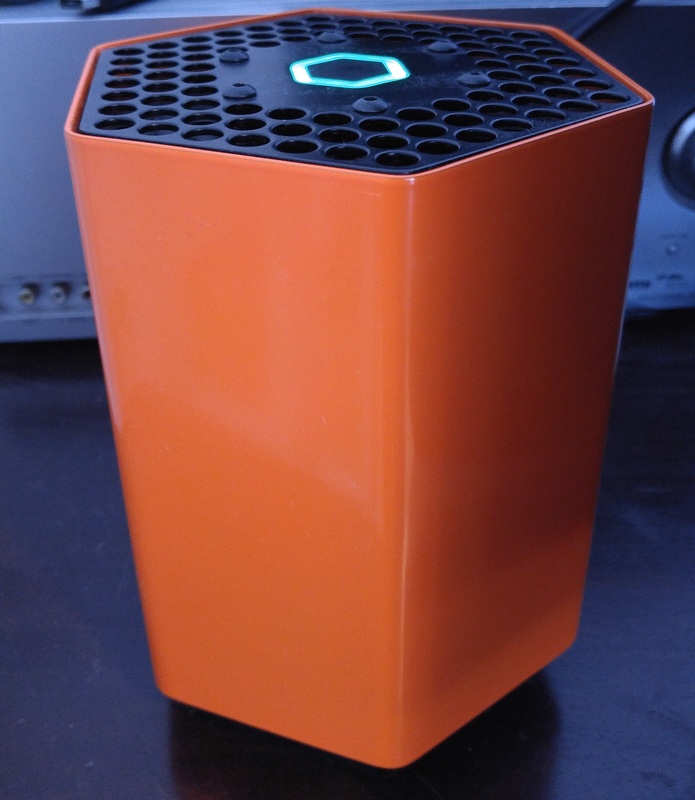 I spent a couple of weeks testing out the Protonet Maya personal server to see if it’s as straightforward for non-techies as it claims to be and whether you’d ever want one for home use. As someone who doesn’t have a lot of call for a personal server, I’ve never really invested a lot of time, effort or money into seeing how I could achieve a ‘personal private cloud’. 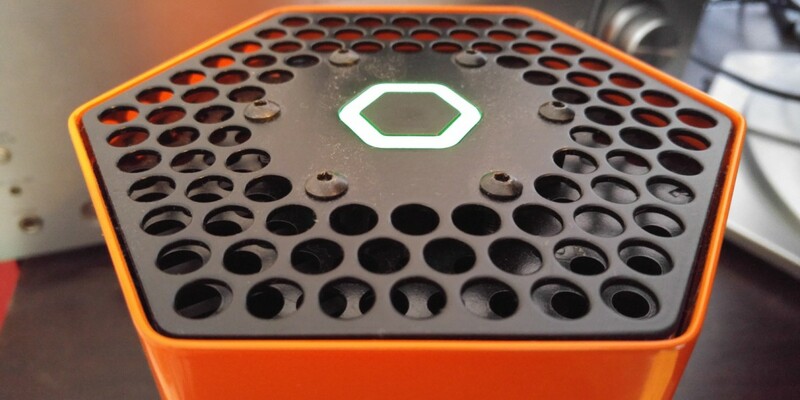 The Protonet Maya, however, is designed for a single user (or a small team) and promises to be the easiest one to set up and use. Indeed, the giant orange wastebin-shaped device was a breeze to set up first time around. Plug it in, connect to it via Wi-Fi and then enter your router’s details to give you a connection back to the outside world. That’s all you need to do in order to loop all your communications, files and anything else through the Protonet. You can also set it up to appear as a network drive each time you start your computer if you want a File Explorer view. If you’re planning on using the Protonet every day, I’d recommend doing this to streamline your file management in the environment you’re familiar with, which in this test case was Windows. There are also native desktop apps for Mac and Windows machines, which do largely the same thing. If that sounds like too much hassle though, you can always just add and access files through the Web interface, accessible at 10.42.0.1, or via a custom URL that includes the name of your Protonet box. What you do with it and how well-used its range of features will be depends on your use case. For me, I tried to use it for a couple of demo projects and to keep in touch with TNW’s geographically-distributed editorial team. The problem here is that, as a team, we already use tools like Slack and Convo to keep in touch, and work largely in the cloud or directly on the site’s infrastructure, so don’t require large amounts of local storage. Nonetheless, if local storage is what you want, the Maya offers up to two terabytes, and different models designed for larger teams provide further storage flexibility. All models get 8GB of RAM, though. Beyond core storage, it has a lot to offer though. In essence, it’s a system that started as a simple server and built in project management capabilities to re-angle it more squarely at small teams. 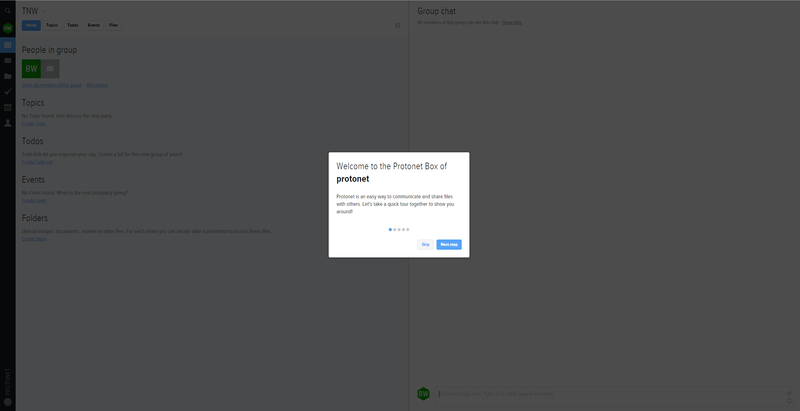 For example, there’s an integrated chat and video calling client that lets you chat with anyone else you invite to use your Protonet – in my case, a couple of TNW team members. 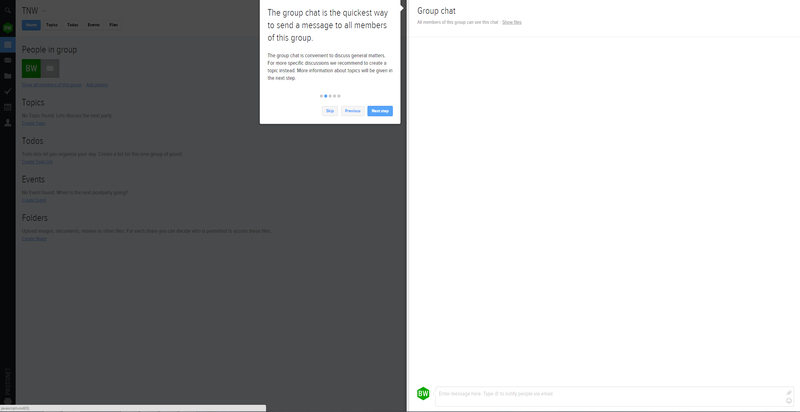 Chat is indeed easy, and can take place in a group environment or one-on-one. 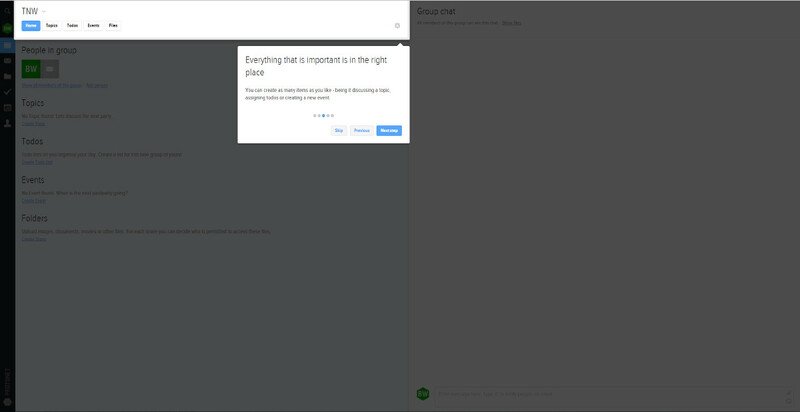 Different chats, say relating to a specific document or a general group, stay where they take place, making it easy to keep everything in context. Protonet has also delivered iOS and Android apps for messaging directly too. There’s also built-in to-do list functionality – all stored within its own section – that allows you to assign different tasks to different people. In my testing, I couldn’t get this to work for some reason – it simply never accepted the new to-do list name I was trying to create, so actually creating the list was impossible. And naturally, you can share files directly with team members but also keep a private section of the server that isn’t shared at all. The Maya’s raison d’etre is to convince the world that personal servers can be simple and still provide the sort of functionality a small business (or large family) might want. The company was founded two years ago with a vision to bring ‘personal clouds’ to everyone and sees its spot in the market as being fuelled by an explosion in digital data, coupled with a growing distrust for the way in which large, faceless companies handle people’s information. With Maya, all data is kept on the server, rather than uploaded to any sort of cloud. Unplug your server from the wall and your data is no longer accessible, for better or worse. What Protonet represents, according to the company, is a way to own your own private infrastructure and bundled services without having to give up ownership of any of your data. Indeed, it’s the chance to know exactly what data you’re holding – and conversely, realize how much you’re giving away in using other services. A lot of the company’s financial progress to date has been through crowdfunding – it raised around $4.1 million last year, $1 million of which came in just under 90 minutes – but the units are now available for sale via Protonet’s site, starting at €1,399 for the basic Maya model. This model is aimed at teams of 10 people or less, which when compared to ongoing monthly subscription services for business hardware or software doesn’t sound like a lot of money per employee. Bigger companies will need the more expensive Carla or Carlita models to support up to 50 employees. 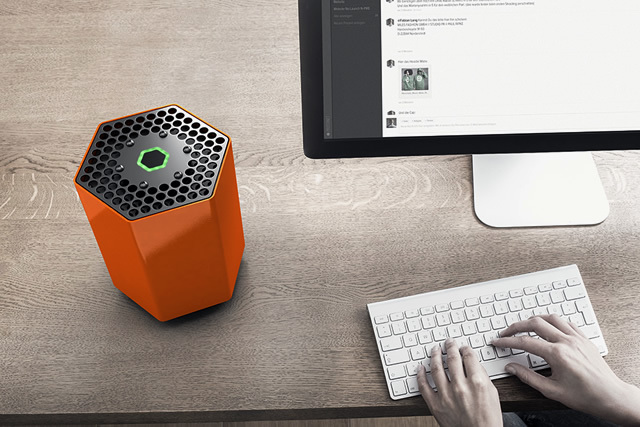 The Maya really has been the easiest server to set-up and use, and yet, despite seeing all of its positives – it really does offer out of the box integrated chat and file-sharing, while allowing you to keep control of everything – I couldn’t see myself shelling out on one for family use. It’d be too complicated still for certain members of my family and go under-utilized. Then again, the Maya isn’t really aimed at me and my family. It’s aimed at small teams, and for that it seems to work brilliantly and simply, if not always flawlessly.